When you apply for a job as a Pharmacy Technician at a major pharmacy chain or a small community or hospital pharmacy , understanding the educational requirements, the experience and certification requirements, the hiring and interview process and how best to present yourself can make the difference between getting hired and not being hired. Read on to learn more about important tips about how to increase your chances for being hired as a Pharmacy Technician at major pharmacy chains such as CVS Health and Walgreens. Before applying for a job as a Pharmacy Technician, be aware of your potential job requirements and be prepared to answer questions during an interview about those duties. Be prepared also to indicate during an interview that you understand that as a Pharmacy Technician you will always be under the supervision of a pharmacist while dispensing medications, filling prescriptions and accepting prescriptions in the prescription intake area. It is important to be aware that in order to work in a pharmacy, you will need to be at least 18 years old and have graduated from high school and obtained a high school diploma. If you will not be entering an accredited Pharmacy Technician program through a technical college or local college or university, some pharmacy chains like Walgreens have Pharmacy Technician Training Programs for their employees who are interested in advancing their careers and becoming Pharmacy Technicians. In this program, Walgreens will continue to pay you a salary while you are being trained as a Pharmacy Technician and they will also pay the for the PTCB certification exam. Consider Enrolling in a Pharmacy Technician program at an Accredited Vocational or Technical or local college or online University. 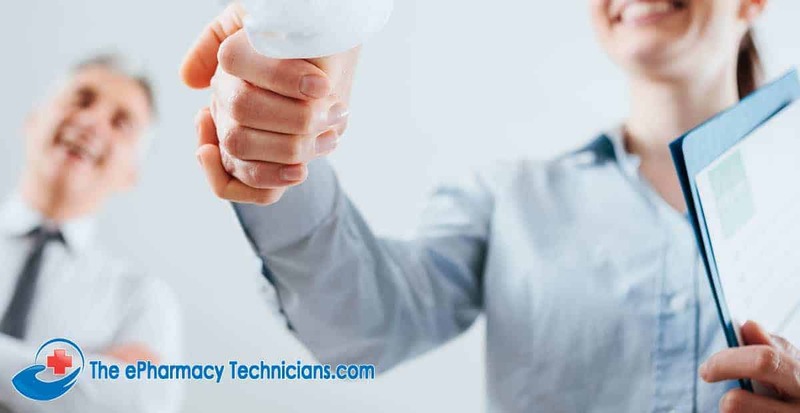 Make sure that the Pharmacy Technician course you enroll in prepares you to take the PTCB (Pharmacy Technician Certification Board) national certification exam for Pharmacy Technicians which is required by most major pharmacy chains. Proper preparation for a Pharmacy Technician job interview is essential in order to have the best chance for the best job possible. Knowledge of and rehearsing for potential interview questions can help you to “put your best foot forward” and help give you an advantage over other well qualified competing candidates. Read on to learn about common questions asked in many Pharmacy Technician job interviews and sample answers and for tips on how best to prepare for your Pharmacy Tech job interview. It is important to dress appropriately, conservatively and professionally which shows respect for the interviewer and which gives a good impression that you are serious about the job. For male applicants, this usually means wearing a business appropriate conservative tie and jacket and appropriate slacks. It is often useful to practice your answers to anticipated questions either in front of a mirror or in front of a recording video camera or smart phone that you can play back and review. This can help increase your confidence and help you to maintain a calm and positive attitude when answering questions in the actual interview. Always be on time for your interview appointment. Be sure to leave extra time to arrive early and rehearse your travel plan if the location is not in a familiar place. Being late for an interview shows disrespect and gives an unfavorable and lasting bad impression. Question #1 – Why do you want to work at our facility? Be sure to research the hospital or community pharmacy where you will be interviewing. Understand their mission statement and stated values and objectives. Research the company and determine if any major company officials have had recent articles published or had interviews on TV or online. Showing that you have significant interest in the company or hospital to research it will provide a good impression to your interviewer. Highlight your unique personal traits and skills that show you will be a good career fit with the facility. Question #2 – Tell me about yourself? Have an answer ready but don’t have it sound rehearsed. It is usually easiest to focus on your education. Start from your early education and proceed in order through your Pharmacy Technician training and end with your current job if applicable. Feel free to discuss any hobbies or activities that you enjoy doing in your spare time. Question #3 – How well do you work under pressure? Both hospital and community pharmacies require the ability to work well under pressure. If applicable to you, you can indicate that you thrive under pressure and find that it helps you be even more efficient. You can give examples where some of your best work was done under deadlines or extreme time pressure. Question #4 – What is your greatest strength? Be humble but be sure to mention strengths that apply to the position you are applying for. For example, you can mention your ability to pay attention to detail such as being extremely careful when returning stock bottles to pharmacy stock shelves. Also, be sure to mention your proven ability to work quickly and accurately especially when under deadlines. You can also mention other attributes that you have such as having a positive attitude, being able to work with other as a team member, being loyal and having the ability to motivate others. Another positive characteristic that could be mentioned could be your ability to solve complex problems while working with co-workers. It is also useful to have specific examples involving your previous work as a Pharmacy Technician to support each of your strengths that you mention. Question #5 – What is Your Greatest Weakness? Be honest and non-egotistical and mention minor things at work that you could improve upon. Then talk about you have been able to work on these skills in order to improve upon them. You can also talk about certain things like how important you feel it is to be accurate when filling prescriptions and how you sometimes have to remind yourself that a double or triple check of a prescription is usually enough. Question #6 – Where do You See Yourself in the Next 5 Years? In answering this question, you can indicate that you see your career path progressing in parallel with the direction of growth of the company. Research company growth projections and indicate your interests such as achieving specialty Pharmacy Technician certification, becoming a manager in the company or even becoming a licensed Pharmacist. Question #7 – Do you have any salary expectations? This is often a complicated question. Be sure to research median salaries for Pharmacy Technicians at similar facilities in your area. Some experts suggest inquiring about the potential salary range while others suggest commenting that your only concern is for a fair salary as you move forward on your career path. Question #8 – Why do you think we should hire you? Emphasize the essential skills that you have developed throughout your training and your experience in the field that separates you from other applicants. Mention any honors received and your abilities to concentrate on details and get jobs done quickly and accurately. You can also mention your mathematical and computation skills and your ability to scrutinize prescriptions for right person, right dose, right route and right time. Also important to mention is your familiarity with pharmacy software and the importance of proper labeling on prescription bottles. Question #9 – Why did you leave your last job? If you are leaving a current job you can suggest that a new position with a new company can allow you to advance your career and develop your Pharmacy Technician skills in accordance with the direction of the new company. If your company is reducing their number of pharmacy employees in a downsizing operation, you can maintain your positivity and simply explain that this has given you the new opportunity to advance your career and learn more with a new and expanding company. Question #10 – Do you have any questions? Asking questions shows that you are interested in the position and are actively engaged in the interview process. Write down a list of potential questions you would like to ask. You can also inquire as to what your exact duties might be in the pharmacy and how long your training period will be. In addition, you can also inquire as to the next step in the hiring process and when you might hear about their decision about hiring you. Proper preparation, dressing professionally and arriving on time or your interview can all help you achieve success when interviewing for a Pharmacy Tech job position. Anticipating possible questions and rehearsing your answers can help you maintain a positive, calm and forthright attitude. Answering questions honestly and directly can help give a good impression ensuring a positive outcome and a great new Pharmacy Tech job position. The first step in applying for a Pharmacy Technician position at CVS Health is to search for Pharmacy Technician jobs you may be qualified for at: localjobster.com. Next, create an application profile so that you can be contacted for an interview. Now, fill out and submit the online application and receive a confirmatory email. A Realistic Job Preview” to see if the job is right for you where a CVS Health colleague describes what the work is like including customer interactions, pace of the work and the rules and procedures. “A Situational Judgment Test” which is an exercise where problem situations that a CVS Health colleague might encounter on the job are presented with possible responses. It is not a multiple-choice test with only one answer. All the answers given are possible and you must select your most likely response and least likely response. “A Data Accuracy Assessment” is an exercise in which you are given different tasks that are related to data entry, checking the accuracy of data. Some tasks include taking inventory and checking prescriptions to medicine bottles. You will be required to enter data or verify that the data presented to you is correct. Under the “Drivers” part of the virtual job tryout, you are given 2 statements and asked to indicate which statement reflects what you like more in a job. In the “Tell Us Your Story” area you will be asked about your work history. If you have no work history, you can answer with school clubs or athletic teams or any clubs or memberships while in high school. The “Work Styles” exercise asks about your style of work. You will be shown 2 statements and asked which one describes you the best. After a CVS Health recruiter reviews your application, he may conduct a phone screening or video interview with you to see if you might qualify for the open position. If this initial screening is successful, a follow-up video interview may ensue or an in-person interview with the hiring manager may be scheduled. If this second interview is successful, CVS Health may extend a job offer to you contingent on passing a background check and a drug test. Once you are employed as a new Pharmacy Technician at CVS Health, you will be required to complete the CVS Health Pharmacy Technician Training Program. After completing this training program, your Pharmacy Technician duties will be restricted by your pharmacy manager at first until you complete all requirements. You might also be interested to read our guide on Getting a Pharmacy Technician Job at Walgreens. Proper preparation for a career as a Pharmacy Technician involves being at least 18 years old, having graduated from high school and ideally enrollment and graduation from an accredited Pharmacy Technician program. Certification from the PTCB is required for employment in most major pharmacy chains. Applying to national pharmacy chains like CVS Health or Walgreens requires many steps and knowledge of the interview process can help increase your chances of being hired. This will enhance your opportunities for a challenging, stable and rewarding career as a nationally certified Pharmacy Technician at a top pharmacy chain.